Hanoi (VNA) – Lawmakers of Vietnam and Thailand should continue to share common viewpoints and support each other in issues of common concern at international and regional inter-parliamentary forums, thus contributing to peace, stability and development in Asia-Pacific. The remark was made during talks in Hanoi on August 14 between Chairwoman of the National Assembly (NA) of Vietnam Nguyen Thi Kim Ngan and President of the National Legislative Assembly (NLA) of Thailand Pornpetch Wichitcholchai, who is on an official visit to Vietnam from August 13 to 16. The two sides noted the soundly developing relations between the countries, which can be seen through regular mutual visits by high-ranking delegations. Chairwoman Ngan affirmed Vietnam’s consistent policy of prioritising the strategic partnership with Thailand. She asked both sides to work more closely to effectively carry out the plan of action to implement their strategic partnership between 2014 and 2018, as well as important cooperation mechanisms such as the joint cabinet meeting, the political consultation, the high-level dialogue on security, and the dialogue on defence policy. The officials said to optimise the countries’ cooperation potential, specialised agencies of the two parliaments should closely supervise the Governments’ cooperation agreements and maintain delegation exchanges at all levels. The two parliamentary friendship groups also need to increase connections. Highlighting thriving trade and investment ties, they noted Thailand ranks 10th among foreign investors in and is the biggest ASEAN trade partner of Vietnam, which in turn is the eighth largest foreign investor in Thailand. Bilateral trade hit 12.5 billion USD in 2016, up 8.9 percent year on year, and approximated 7 billion USD in the first half of 2017, up 22.5 percent from a year earlier. Chairwoman Ngan asked the two sides to coordinate more strongly to reach the targeted trade revenue of 20 billion USD in 2020 and reduce trade imbalance since Vietnam still records high deficit in trade with Thailand. They should provide more favourable conditions for Vietnamese and Thai businesses to boost trade and investment activities, she added. She pledged optimal conditions of the NA and the Government of Vietnam for Thai firms to invest in such fields as tourism (especially marine tourism), textile-garment, footwear, cosmetics, food, agricultural products, machinery, chemistry and material production. These are the areas that match Thailand’s strength and Vietnam’s potential. Echoing his host’s viewpoint, NLA President Pornpetch Wichitcholchai said the two countries need to step up partnership in trade and investment and gradually balance their trade. Thailand wants more Vietnamese investment, he noted, stressing that the two legislative agencies are ready to work together to resolve obstacles facing investors. In 2016, about 800,000 Vietnamese tourists came to Thailand, but only 260,000 Thais visited Vietnam. Pornpetch Wichitcholchai said he hopes after more routes linking the countries are inaugurated, the number of Thai visitors to Vietnam will surge. 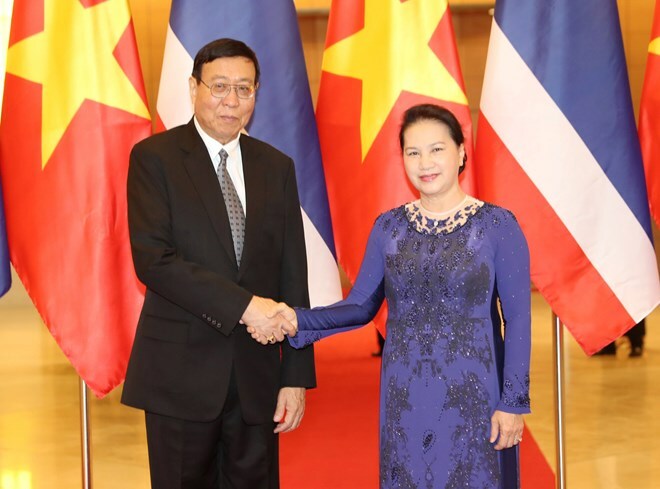 Regarding cooperation in ASEAN, Chairwoman Ngan said as ASEAN members, Vietnam and Thailand need to enhance solidarity to promote the bloc’s unity, strength and central role. They should persist in ASEAN’s common principles and viewpoints on regional global issues. She urged further coordination with each other and with other Mekong countries to promote cooperation, management and sustainable use of the river’s water resources, and to effectively implement the outcomes of the seventh Summit of the Ayeyawady – Chao Phraya – Mekong Economic Cooperation Strategy (ACMECS 7), held in October 2016. In terms of agriculture, fisheries and labour, the legislators discussed the acceleration of signing a new memorandum of understanding on agricultural cooperation between Vietnam and Thailand, and the signing of an agreement on setting up a hotline for fishery activities at sea. Ngan suggested both sides consider expanding the fields and jobs opened for Vietnamese workers in Thailand. The two countries’ labour ministries need to promptly carry out relevant procedures so that Thailand can officially recruit Vietnamese workers. She also thanked the Thai Government for favourable conditions for Vietnamese-Thais to integrate into the local society and for the construction and management of the relic sites of Vietnam’s late President Ho Chi Minh in Udon Thani and Nakhon Phanom provinces. At the talks, the officials discussed international and regional issues of shared concern. Chairwoman Ngan said Vietnam wants to keep coordinating with Thailand to strengthen ASEAN’s solidarity, boost the bloc’s common voice and role in settling security and development affairs in the region, and help deal with East Sea disputes through peaceful means in line with international law.